There have been a few times lately that I’ve looked over at the Pokéball Plus that came packaged with my copy of Pokémon: Let’s Go Eevee! and considered picking the game back up again. Until that time, Porygon will remain trapped inside. It’s unfortunate that the game got lost amongst the noise of Red Dead Redemption 2, Persona 5 which I had recently decided to finish as well as Super Smash Bros. and a few other assorted games and experiences. I’ll get back to it properly soon. I absolutely will. I’m moments from finishing Victory Road. My journey to become the Champion isn’t far from its conclusion. Until then however, the Pokéball Plus remains on my desk. And as I looked at that Pokéball, the horrific thought of trapped Pokémon began to dawn on me. My Porygon has been in that Pokéball for over 4 weeks now, every now and then making some noise when I accidentally nudge the table as if to remind me that it’s still there, waiting for me. But what if I wasn’t here? What if my Pokéball Plus was lost? Dropped in the tall grass in the meadows and woods near my house? What if (heaven forbid) I die and nobody is aware of my Pokémon legacy and the companion I have yet to release back into the wild, a box or the like? Or what if my Pokéball were destroyed or damaged, potentially along with the Pokémon it holds? Things begin to get murky if you consider that the Pokémon show and games have touched on the concept of death or abandoned Pokémon, but ambiguously and not in any detail. We aren’t aware of what happens to both the trainer and their Pokémon following a trainer’s death for instance leaving us with only speculation to fill in the vital gaps. There is one case of the character Pokémon Hunter J being presumed dead in episode 150 of the Diamond & Pearl series, but it once again leaves the fate of both herself and her Pokémon in a state of ambiguity. As she also only held three Pokémon at the time it could be argued to be unlikely that she left any other Pokémon behind. I then considered the structural integrity of a Pokéball and their resultant hardiness. Would my Porygon survive if my Pokéball Plus were dropped into heavy traffic and crushed under the wheel of a passing car? I highly doubt it, as mine is made only of plastics and rubber, with the only metal being the components and connections inside. It goes without saying that my Pokéball is merely a representation of a “real” Pokéball, the Pokémon carried within merely a representation of the “real” Pokémon that would otherwise inhabit this “real” ball. Truly I have little to worry about, as the Pokémon in the Pokéball Plus isn’t real, is not programmed to feel and doesn’t really exist “inside” the Pokéball Plus. But could the same be able to be said of “real” Pokémon in-universe? There are many theories around how a Pokéball is designed to hold a Pokémon and how that Pokémon continues to exist within, but the general consensus is that the Pokémon is first converted into a form of energy before being transported into the Pokéball. After this comes many interpretations of the Pokémon’s state depending on the source material, but it’s generally accepted that the Pokémon is conscious and retains its form and image existing within a pleasurable environment that makes the Pokémon less likely to want to escape. So the Pokémon inside the ball is still said to be alive and aware, but is it just a digital copy of an otherwise converted physical being? Does this make it any different in nature than the binary code making up the Porygon held in my Pokéball Plus? If this “code” is still able to think and feel and want maybe so, but to some people? Maybe not. Depending on the source, the effect of a damaged Pokéball can also vary. 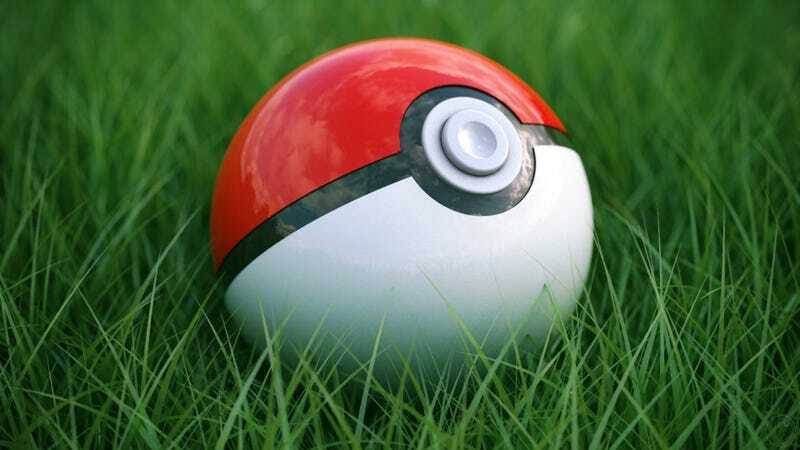 Most of the time a damaged Pokéball will either simply release the Pokémon from the ball and leave it unable to be recalled until that specific ball is repaired, or in rarer cases leave the Pokémon unable to be released from the ball, say if for instance the hinge mechanism of the ball is damaged. How easily repairable/affordable is a Pokéball to the average 10-year-old child? And what of the converting mechanism of the ball itself? Could it too be damaged? In real life a complex electronic can break in many ways. It’s antenna could break, limiting its wireless capability, or the battery can wear over time rendering it completely inoperable. It isn’t beyond the scope of capability that a certain component of a Pokéball could also break or wear over time. The Pokémon series doesn’t answer a lot of these questions and for good reason. A lot of these scenarios are heartbreaking at their very best! But these questions only delve into the nature of the ball itself. Within the world of Pokémon we know that many things exist as a facsimile of our own world; The laws of physics for the most part seems comparable. The world that these people live in seems to provide the same global habitat as our Planet Earth. Most importantly though is the people. They are unmistakably human and seem to display needs and characteristics evocative of our own, such as hunger, thirst, aging and such. Being human also infers imperfect traits such as forgetfulness and neglect. They feel emotions of varying intensity, can be driven by aspiration and passion and maintain vital personal connections with the people and creatures they meet in their world. But with human nature comes both light, and darkness. Here in reality approximately 7 million cats and dogs are abandoned every single year in the United States. These are animals that for one reason or another are left for shelters or left to fend for themselves. A third of these sheltered animals are put to death despite almost all of them being suitable for re-homing. They are not put to sleep. That’s a terminology that allows us to distance ourselves from the harsh reality of the situation. Brock himself on the TV show aspires to become a Pokémon breeder, an allusion to the real life profession of pet breeding. If there exists within this universe a means of breeding Pokémon in order to make a living so too must exist some type of system resulting in an unneeded or unwanted population of Pokémon. I’m not going to argue that things would be quite as inhumane as they can be in real life due to the invention of storage technology in the Pokémon universe, but it’s doubtless an issue that still exists in some form. If there are people capable of animal abandonment in a world that lacks storage technology that makes it much more convenient to do such a thing, how easy must it be for a trainer to become bored of their Rattata and “accidentally” drop the unwanted Pokémon in its Pokéball into the tall grass? Or a river or worse? Many people might argue that abandoning a Pokémon is perhaps harder to do than abandoning an animal as most Pokémon seem capable of a level of intellect so eerily human that we personify them at least a little more than we might do say, a dog or a cat, but we still see this exact thing happen in Season 1 Episode 11 of the TV show, in which a Trainer abuses and abandons his Charmander with full knowledge that it will perish in the rain, and that the Charmander will wait for him regardless. We know and can see that people within the Pokémon universe are capable of the kind of cruelty we see in reality. And we too as players of these games are guilty of similar abandonment. Maybe we haven’t callously dropped an unwanted and defenceless Pokéball into the wild for it to meet any number of fates, but when was the last time you used your launch-day copy of Pokémon Ruby or Sapphire with its internal battery keeping count of every day that passes in real time? Provided the battery still functions (which admittedly is highly unlikely), there are Pokémon stored in Pokéballs and PC Boxes that haven’t seen the light of day in almost 17 years. Of course don’t misunderstand; this is just a game and none of us are guilty of a moral crime for choosing to not play it anymore, but it isn’t a stretch to consider that this is how some trainers might treat Pokémon in their world, where catching Pokémon isn’t a game. And on top of all of this awfulness, something to consider is that storage space within these systems in the Pokémon universe isn’t exactly shown to be infinite in size; the latest entries into the Pokémon games Pokémon: Let’s Go, Pikachu! & Eevee! provide us with storage space for 1,000 Pokémon. But what happens when all of the storage space is used up? It would be likely that any organisations devoted to the storage of abandoned Pokémon would have greater resources available to them than the average trainer, but it still seems as though that storage space is finite, and will eventually overflow. You can always release Pokémon and this is a feature that has always been shown in the games and shows, but is that really any different from abandonment? Is it any different from saying “I don’t love or want you anymore”? It isn’t like we “release” our cats and dogs into the wild just because we decide it’s time to let them go. And only now writing this I find myself wondering; is this where the invention of Pokémon candy was realised? Just as we have methods of controlling and farming livestock for human consumption in real life (albeit not necessarily just for animal population control), so too must there be systems in the Pokémon universe where culling of some kind is considered necessary at some extent. The mechanics and production of this candy is still unknown, but it isn’t beyond the realms of possibility that some morally corrupt person or organisation would use these creatures for the material components of their bodies, just as humans have done so for hundreds of thousands of years with animals. When I began writing this piece, it was a simple musing around the concept of “I wonder how many Pokémon are trapped in Pokéballs if you really think hard about it”, but the harder I DID think about it, the more I found myself wondering: In a system primarily dominated by a society of humans living within ecosystems mimicking ours in the real world, how different would it really end up being from everything we already know? How much more or less compassionate would people end up being in a world where hyper-intelligent creatures replace our real animal counterparts? In 2012 PETA (an organisation that I absolutely hate despite being vegetarian) released a satirical Pokémon game called Pokémon: Black & Blue, a parody of the Pokémon franchise that was meant to demonstrate the horror of capturing animals to make them fight each other. This ended up being a badly executed idea, and one that no sane person should take seriously as most people who play the Pokémon games do not condone animal fighting for real. Conversely, I think it does ironically encapsulate just how awful the treatment of Pokémon might be in a universe similar to our own where not everyone will treat their creature companions the same way. In any case, we can’t deny that the primary form of Pokémon entertainment in their universe is to make the damn things fight each other, and given we have our own real life counterpart to this awful activity… I don’t think a look behind the curtain would show us anything too distant from our reality after all.